This post is about the1996 Buick Roadmaster Limited Air Conditioning Circuits, Auto A/C Wiring Diagrams. It shows you the brief content of the 1996 Buick Roadmaster Limited Air Conditioning Circuits. Herein, you will see the parts of it. I suggest for those who will have wiring works on it, should comprehensively understand and notice all of the parts. Among those parts you can see the list as the following, such as: i/p fuse block, heater a/c control assembly, blower motor control module, blower motor, outside air temperature sensor, inside air temperature sensor, vacuum electric solenois, underhood electrical center, data link connector, sunload temperature sensor, a/c compressor relay, air mix motor, a/c cycling switch, a/c compressor clutch diode, a/c compressor clutch, maxi fuse, primary engine coolant fan relay, secondary engine coolant relay, power train control module (relay controls, a/c request, a/c on signal, press switch input), idle speed control power steering pressure switch, primary coolant fan motor, secondary coolant fan motor. This schematic wiring diagrams also shows you the color lines on each parts. It eases you in determining each part so you will minimize the errors. 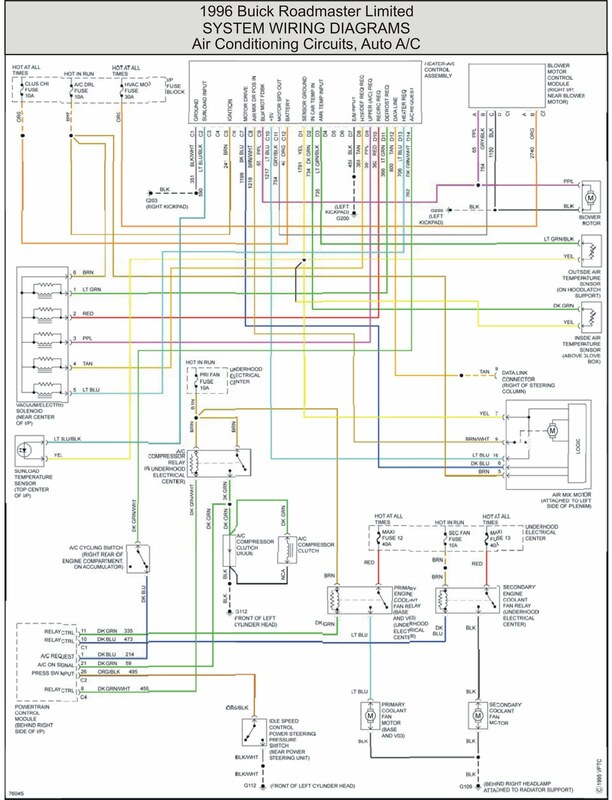 Well, here is the schematic wiring diagram for the 1996 Buick Roadmaster Limited Air Conditioning Circuits, Auto A/C Wiring Diagrams. It is clear and readable. You may click on the image to enlarge, or save it into your harddrive and view it using the picasa photo viewer for the best view.